If you have an Android Phone or Tablet that does not have Google Play. You will manually have to download the data file. 4) once the app is installed and the file is in that directory you have full use of the app. ** Note to Users: the app is free to try — get the 8 POV characters from the first book, select places, and the map for Westeros — then purchase InfoPacks with detailed guide content for each book in the series. ** If you are experiencing issues with in-app purchases, see the FAQ below for simple steps to resolve the problem. 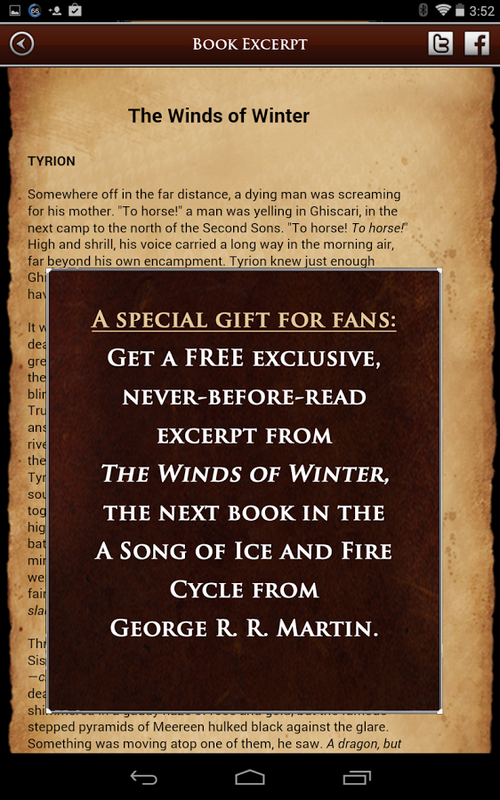 Get the ONLY OFFICIAL A SONG OF ICE AND FIRE / A GAME OF THRONES APP from George R.R. Martin: Hundreds of detailed character bios, interactive maps, and anti-spoiler protection! 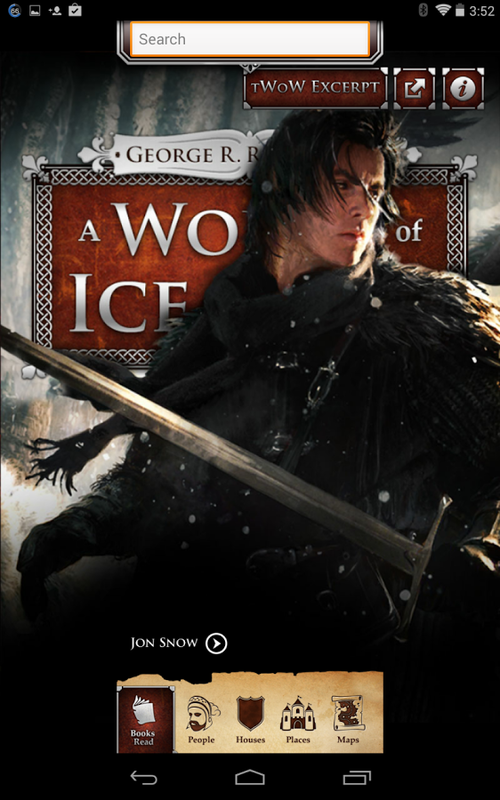 A WORLD OF ICE AND FIRE is the first official app guide to George R. R. Martin’s bestselling cycle. Whether you’re reading the books or watching the television series, you’ll want this definitive companion with profiles of 600+ characters, 550+ places, and major houses, as well as interactive world maps. 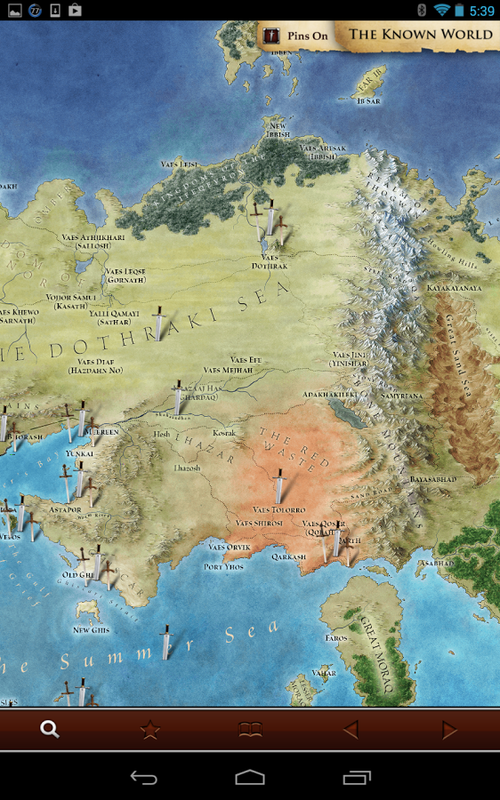 Test drive the app for free and get 8 POV characters from A Game of Thrones and an interactive map of Westeros. Buy one InfoPack for each book – or buy all 5 at once and save a dollar. Get all-new information for free every time an InfoPack is updated. – Click the restore purchases button in the WOIAF app — this will restore any info packs you have already purchased. 2. If you run into any issues with content or images not appearing, here is a recommended fix: In the settings menu on your device, go into the Applications menu, then select the World of Ice and Fire app. Under “Storage” click the “Clear Data” and “Clear Cache” buttons. Then do a force-stop of the app. You can click the “Restore Purchases” button in the Books Read menu to restore all content. For any other issues, please email us at support@randomhousedigital.com. OBB file is not working, the app still wants me to purchase the info packs.